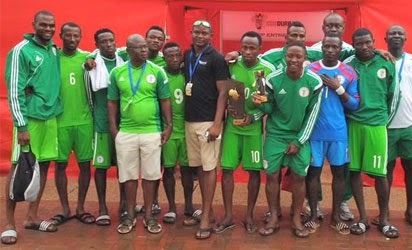 Football fans on Sunday praised the Nigeria Super Sand Eagles effort for finishing third at the Power Horse Beach Soccer African Trophy in South Africa. The Sand Eagles defeated their South African counterparts by 9-3 to finish third. 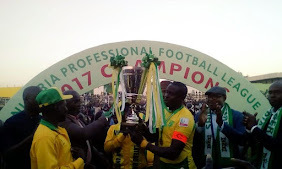 Kayode Tijani, a sport analyst, while commending the team said in Lagos that the team could have done more if given adequate support to prepare for the competition. standard league and also give adequate attention to the Sand Eagles. “The players have tried their best and they have achieved this and all their past achievement was through personal effort. “Most of the players in the team are from our national league and this is not supposed to be so because there should be a running league for beach soccer. “The NFF should do the needful by enhancing the development of beach soccer in Nigeria and also make sure that the team gets good remuneration always,” he said. Akin Ainu, the chairman of Badagry Divisional Football Association, praised the team for their performance. Ainu noted that the team could have played in the final if not for the late goal conceded against its opponent at the semi-finals that ended 6-5 in favour of Senegal. “The teams have done well and should be commended for the effort,” he said. NAN reports that eight teams participated at the tournament which kicked off on March 6. Senegal won the tournament after defeating Cote d’Ivoire by 5-4.